Gov. Chris Christie on Monday night defended his visit to the governor’s seasonal residence on Island Beach State Park, which was closed to the general public during a three day-long government shutdown. Christie, a Republican, and Democratic legislative leaders announced a deal Monday night that ended the standoff. Christie will receive more state oversight of Horizon Blue Cross-Blue Shield, the state’s largest insurance company, and will cap the company’s surplus and mandate that any excess be returned to ratepayers. Democrats did not, however, agree to his request for $300 million to be taken from the surplus to go toward drug rehabilitation services for opioid addicts. In exchange, Christie agreed not to use his line-item veto power on several Democrat-backed measures, including a school funding measure that may cut $3.3 million from Toms River schools and $2.2 million from Brick schools. The budget will also shift $13.5 billion in lottery revenue to the state’s beleaguered public employee pension system. While the sting of the loss of government services may have been tempered for many residents since the shutdown occurred over the weekend, thousands of would-be beachgoers at Island Beach State Park were kept from entering by police, while Christie and his own family and guests lounged on the sand near the residence. Christie said he only spent about 40 minutes on the beach, speaking with his wife. But during the time he was there, a Star-Ledger newspaper photographer snapped a picture of him from a rented plane, which almost immediately went viral on social media nationwide. 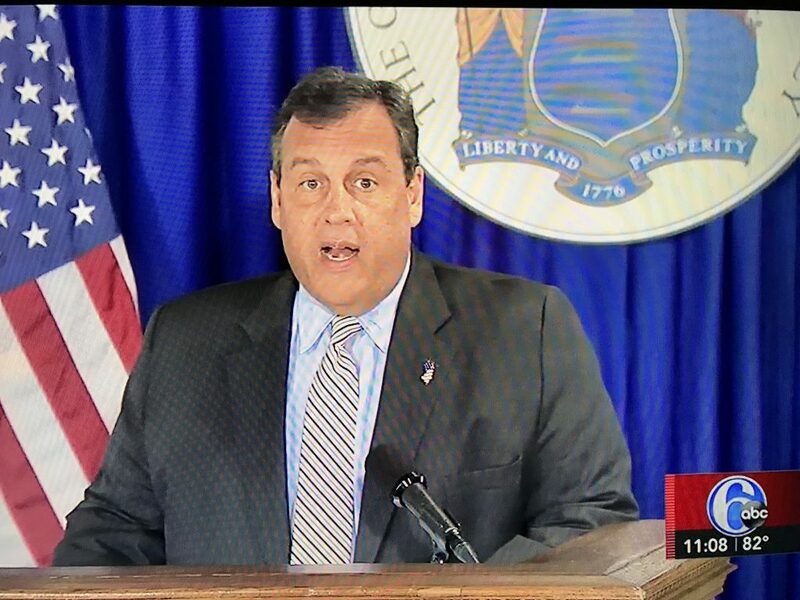 “My son came to me yesterday and apologized for me, saying, ‘I’m sorry dad, that I got you all this heat.’ I looked at him and said, ‘you never have to apologize for this ever,” Christie said. “I simply wasn’t going to cancel that because Vince Prieto couldn’t get 41 votes together for a budget,” he said, referring to the state General Assembly majority leader, who had previously vowed not to allow the Horizon measure to move forward until after the state’s budget was passed. The status of funding for Toms River and Brick schools in the final bill was not immediately clear. Christie did not address in his speech, nor did any reporter present question him on it. Toms River Regional Board of Education President Ben Giovine said late Monday night that he was waiting to hear from local legislators on the situation. The combined $5.5 million cut in education spending in the two towns – a deal struck by Prieto and Senate President Stephen Sweeney – could lead to teacher layoffs and a reduction in student services. It could also spur a significant property tax increase if the services were to be restored in the following year’s budget.